In Islam, faith on its own is not sufficient. A Muslim is enjoined to perform worship rituals to show his belief in Allah. A good religious subject is required to reinforce, improve, enhance and enrich his or her conduit by practicing, i.e. repeating, prayer rituals. There are two worship practices in Islam in which prayers are repeated by numbers: salat (daily ritual prayer) and dhikr (allusion prayer). Each of these practices is organized through specialized objects to accomplish worshiping as it ought to be performed. It is believed that it was advised by the prophet Muhammed to recite Subhanallah (“Glory be to Allah”), Alhamdulillah (“Praise be to Allah”), and Allahuakhbar (“Allah is great”), 33 times each, after each salat. The salat tespih is specialized for the specific requirements of this practice, in that it consists of 99 beads, with an indicator bead after every 33 that signals the transition to the next phrase. Some sects of Islam pray the first prayer 34 times: accordingly, their tespihs have the indicator bead after 34 beads. In this specific case, salat tespih consists of 100 beads. Dhikr is a devotional act that praises Allah and emphasizes His glory by reciting one of His good qualities or names, or the name of His Prophet. Although it is not one of the five pillars, devout Muslims try to dhikr as much as possible, due to the rewards the Qur’an promises for those who perform dhikr. As the prophet Muhammed expressed, “Whoever recites the tasbih, (“I extol the holiness of God”) and the tahmid (“God be praised’) a hundred times, morning and evening, will have all his sins forgiven.” As a traditional form of devotion, repeating these prayers has been, and continues to be, important in Muslim cultures. The devout Muslims observed in this study, for example, repeated 4-5 thousand prayers a day. 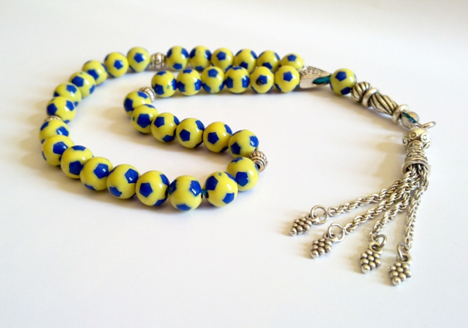 To count the high numbers of prayers repeated, Muslims use counting tools, including tespihs with 100, 500 or 1000 beads. 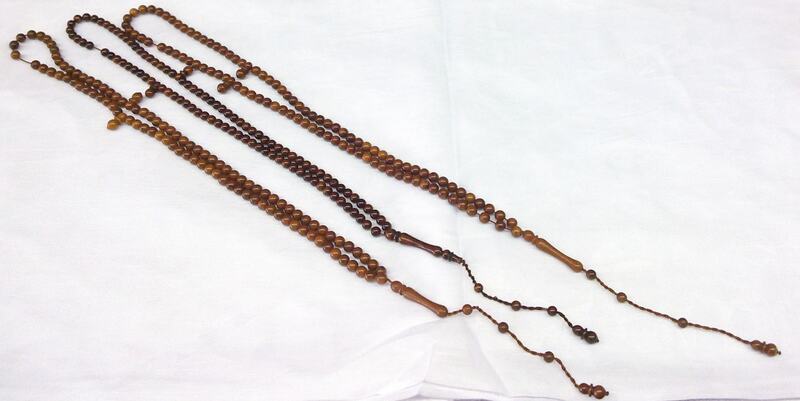 In terms of basic structure, the dhikr tespih does not contain indicator beads as the salat tespih does, but is a continuous chain of beads or prayers. In most cases, at the end of the tespih, where the two ends of the rope come together, there is a slender, tubular-shaped bead. After this end bead, there is a tail, which basically consists of loose ropes or extra beads. The extra beads on the tail of dhikr tespih are used to count the complete rounds of tespih prayed. For example: after the first round of the 100 beaded tespih is completed, they count 1 bead from the tail, and move on to the second round of 100s. In cases where the tail does not contain any beads, it was observed that the rounds were marked by safety pins. An object from the profane domain, a safety pin, is combined with the sacred object to facilitate the sacred worship practice. Materiality is appropriated so that it enables sacred practices to be accomplished. The materiality of tespih holds an important place for the relationship between object and the user. According to some practitioners, the tactile stimuli experienced during the manipulation of tespih created a sensation of unity between the body and the prayer. In this way, participants claim to be more “satisfied” “by feeling the prayer.” During prayer, the tespihs with fewer beads are held in one hand. Tespihs with extreme numbers of beads (500) are usually held with two hands, palms turned upwards, lying loosely on the lap. A rhythmic rocking of the whole body, in the sitting or kneeling position, usually accompanies the prayer. 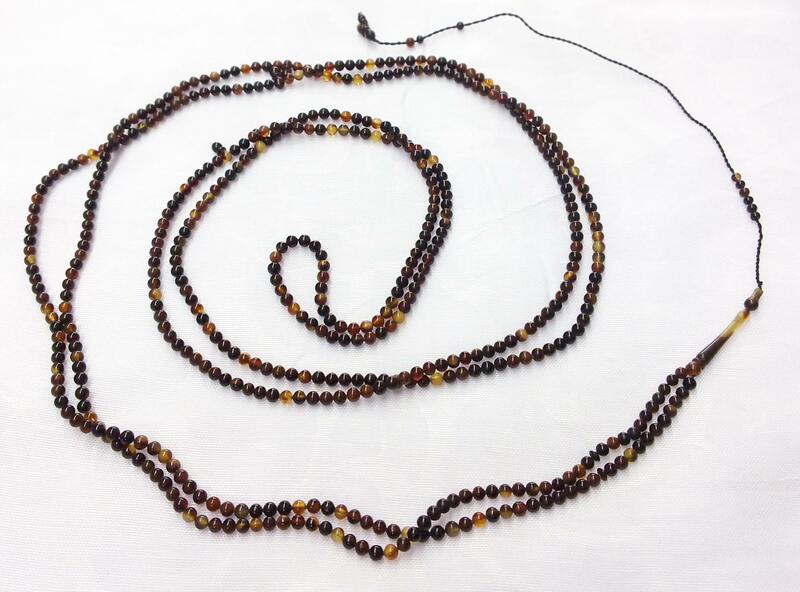 The very material properties of tespih, such as the size and frequency of beads on the string, were stated as important individual criteria for the harmony of the prayer and its repetitive movements. The tespih is not, however, merely a passive instrument to be “used” or manipulated during the recitation of prayer; most of the participants value tespih as sacred and as a symbol of belief in and closeness to Allah. The tespih is a holy object designed for a specific worshipping practice, and the materiality of tespih, the manifestation of the sacred in material form, is significant for the object. In accordance with the emphasis on the sheer materiality of the tespih, physical qualities such as the number or the substance of the beads (e.g. sacred material) or the haptic-visual qualities (like having the Name of Allah inscribed on the beads) were said to add to the sacredness of tespih. For example, one of the participants stated he did not prefer to carry a 33-beaded tespih. 33 is regarded as a sacred number, so he took out one of the beads in his tespih and carried the one with 32 beads in his pocket for daily usage. In addition to counting prayers, the tespih is an intensely personal object, charged with meanings regarding identity, social conduct and religious decency. Thus, it was stated that it is not preferred to use another’s tespih, or to lend one’s tespih to another, since the tespih is shaped in the hands of the believer, with his sins and good deeds. The tespih can also be used to convey social messages about belief, character, status, and even allegiance to certain sports clubs. So there are various tespihs with different aesthetic properties, which, in turn, articulate different personal choices. For instance: there are tespihs that have the beads in the shape of a football and carry the colors of particular clubs, along with precious stones and sacred materials, such as date palm. The way the object is carried can also express aspects of the wearer’s personality and social status. Some Turkish youth, for example, swing tespih at hand to make sounds and pass the time, or combine rolling tespih in the hand with gestures, to show toughness; others claim that such ostentatious behavior—contrasted with modestly holding the tespih in the hidden recesses of a pocket or a nag—is disrespectful toward the tespih, and show one’s inferior characteristics or status. Such examples point to a constant appropriation of objects to negotiate the domains of the sacred and the profane.